Lyndon Baines Johnson (August 27, 1908 – January 22, 1973) was a member of the Democratic Party and the 36th president of the United States serving from 1963 to 1969. Johnson took over as president when President Kennedy was killed in November 1963. He was then re-elected in the 1964 election. His time as head of government had two chief parts, his policies inside the country which included Civil rights and caring for the poor, and also his policies that were open to argument which resulted in the United States fighting the Vietnam War. Johnson was born in Texas. His father was a politician who had worked for the Texas state government. As a young adult, he was a teacher. He was elected to the House of Representatives in 1937, then to the Senate in 1948. He won the Senate election by just 87 votes. In the Senate, Johnson very quickly became powerful and in 1955 became leader of the Senate and was the youngest to have ever held that position. He started great programs for the public. It helped that he knew the other Senators well and could often persuade them to support his ideas. In 1960, he ran for President, but during the contest to see who the Democrats would support, he lost to John F. Kennedy. Johnson was then selected by Kennedy as the candidate Vice President. Kennedy narrowly won the election and Johnson became Vice President. Like most Vice Presidents, Johnson did not like the job. It gave him too little power. Lyndon B. Johnson was well known as someone who could persuade other lawmakers in Congress to pass laws. To gain more support for his ideas, he often arm-twisted other politicians (meaning he would threaten them if they didn't agree with him). Johnson took over as President after Kennedy was assassinated. He finished Kennedy's term as president then in 1964 he ran for re-election and won easily against Barry Goldwater. Johnson won 61.1% of the vote. This is the highest percentage of the vote ever won by someone running for President since 1820. Johnson began a "war on poverty". He created the Great Society (a series of government programs intended to improve the living standards of the country). These programs include public broadcasting, protecting the environment, Medicare (health care for the elderly), Medicaid (health care for the poor). He supported civil rights for African Americans and continued where Kennedy left off in giving them freedom. The Voting Rights Act in 1965 gave the government powers to stop them from being denied the right to vote. Compared to Kennedy's weak relationship with Congress, Johnson was able to convince politicians to support some of the same policies which they opposed under Kennedy. At the same time, Johnson increased the United States involved in the Vietnam War. Johnson increased the number of soldiers in Vietnam from 16,000 to 500,000 in order to stop the Viet Cong - the Communist rebels in South Vietnam. As the years passed, Johnson became more and more unpopular as the war kept on going without an end in sight. By 1968, almost 1000 American soldiers were being killed in Vietnam every month and the enemy still hadn't been defeated. In March Johnson said he would not run for re-election. Johnson's time as president ended in January 1969. He went back to Texas to live his ranch in Stonewall. Johnson died at his ranch on January 22, 1973, at age 64 after having a heart attack. Johnson had a state funeral. The final services took place on January 25. The funeral took place at the National City Christian Church in Washington, D.C. 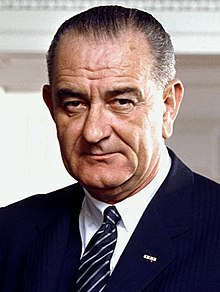 Despite the disaster in Vietnam, Johnson is still thought of as being a good president by historians because of what he achieved with civil rights. In 1973 The Manned Spacecraft Center in Houston was renamed the Lyndon B. Johnson Space Center. ↑ "American Experience: LBJ". WGBH and PBS. 2013. Retrieved 16 November 2013. Wikimedia Commons has media related to Lyndon B. Johnson. This page was last changed on 22 April 2019, at 02:48.